Using nothing more than a smartphone and less than $10 in hardware supplies, Missouri S&T biology students built their own microscopes in biology lab this past fall. Daniel Miller’s DIY smartphone microscope can magnify samples up to 175 times with a single laser pointer lens — nearly 400 times if he stacks two lenses. The do-it-yourself microscope is part of the Transforming Instructional Labs project. Funded through a grant from the University of Missouri System, the project is designed to re-imagine how lab courses can be taught in five science and engineering disciplines on campus. Project organizers hope to create a how-to manual for other colleges and universities. Terry Wilson, associate teaching professor of biological sciences, offered her general biology students extra credit for building their own microscopes. They built a stand with carriage bolts, nuts, wing nuts, washers, plywood and Plexiglas from a hardware store, laser pointer lenses, and LED click lights from a keychain flashlight. The smartphone became a tool for viewing, enlarging and photographing lab specimens. 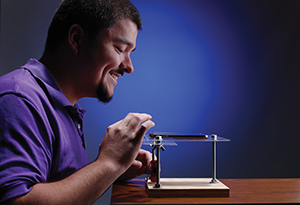 The DIY microscopes can magnify samples up to 175 times with a single laser pointer lens, or nearly 400 times when stacking two lenses, says Daniel Miller, BSci’12, MS BSci’14, who created a prototype to use last spring in Wilson’s General Biology lab, where he served as a teaching assistant. He also offered extra credit to any of the 50 students in the lab who would build one, and 15 students took him up on the offer. Wilson also experimented with her Cell Biology lab lecture this fall as part of the Transforming Instructional Labs project. She “flipped” the lab lecture part of the course by offering it online but continued to offer the lab in the traditional manner.